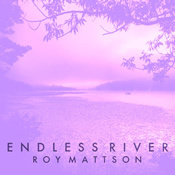 I have said it before, but it bears repeating: Roy Mattson is an ambient artist you need to be listening to, and Endless River is a very good place to start. Hovering quietly between classic ambient and spacemusic, this release shows several facets in its 90-minute run time, all of them engaging and well-executed. The sparkly, chipset-influenced tones bouncing around the first track, “Setting Out,” for example, are only distantly related to the still, wind-nudged chimes of “Confluence,” and they both come from a different place than the very atmospheric, almost dark environs of “Down River.” This latter track borders on creepy in spots, courtesy of the creaking and moaning of old boards and a growling bass drone. I am reminded of the excellent album Sextant by Brannan Lane and Ashera. “Water Maze” is a standout track; bright tones with a hint of shimmer are backed with perfectly underplayed water effects and twists of sound with an analog-synth feel. All of this plays out across long pads dialed well into the backdrop. It’s a nice, calming ride. Its kindred spirit comes later on “Navigating the Flow.” A charming sequencer line adds a touch of rhythm, the water sounds feature more prominently without being intrusive, and Mattson brings in lush flute melodies to make it all soar. Worth noting that Mattson has loaded Endless River with organic sounds—bamboo flutes, shakers, stones, seed pods, conch shell trumpet, and more—but it’s typically laced in very subtly. On “Stone Clouds” the organics get their place up front, but again, it’s done with a restrained hand and the effect is pretty much perfect. Mattson is a new name in the ambient realm. He only began releasing music, as far as I can tell, about a year ago. That means that right now is a great time to start listening to him. With Endless River I hear an artist who has paid close attention to the masters of the craft who’ve inspired him but who is also ready to chart his own sonic course. Get on board now.